Now that it’s January and we start to cleanse ourselves of the holidays, we seem to fully embrace winter vegetables. Not that we don’t like our winter vegetables, we just like spring and summer produce better (we like spring and summer better than winter, period). But when we do revisit winter vegetables we always come back to parsnips and wonder why we took so long. Parsnips aren’t just a decent winter vegetable, they can be sweet, flavorful and a lovely compliment to the roasts, braises and stews that make up so much of our cold weather cooking. And, believe it or not, when you roast parsnips with a little fat, salt and thyme you get a snack you can enjoy at any time. If you are unfamiliar with parsnips (or had a bad experience and tried to forget), they are a root vegetable that looks like a large ivory-colored carrot (some varieties are less uniformly shaped). Parsnips combine some of the sweetness of carrots and a bit of the earthy flavors of potatoes with a slight “rooty”, sarsaparilla-like note. Parsnips play very well with heavy fats like cream, beef drippings and bacon fat, so they tend to go with heavier dishes. But you can roast, mash or purée parsnips with just a bit of added fat (or sugar if you are so inclined) for a healthier dish. The only issue left to deal with is texture. The big issue with parsnips is in many dishes they are either undercooked and/or have stringy and woody sections. Nigel Slater once noted that most people experience their first parsnip in a roast or stew when they think they just ate a “woody potato”. First impressions often last a lifetime, and this is no way for people to discover parsnips. (It isn’t an accident that most chefs love parsnips, but mostly serve them pureed.) But there is a simple trick that takes care of any textural issues, just cut the parsnip in thin wedges and steam it before you oven roast. 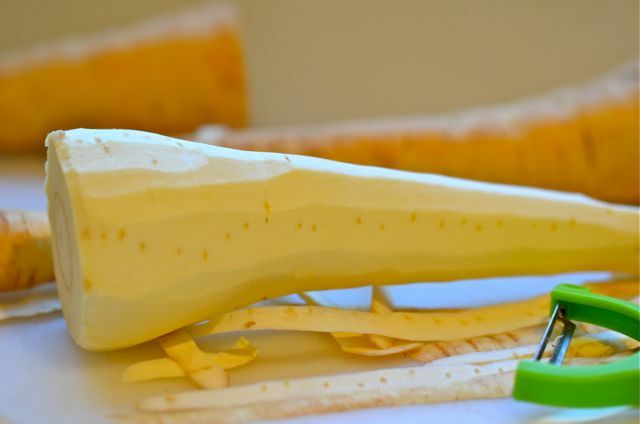 The smaller pieces cook in less time and the steaming allows the rest of the parsnip to cook evenly. It does take a few extra minutes, but what else do you have to do in the dead of winter? Otherwise, this is a very easy dish to make. 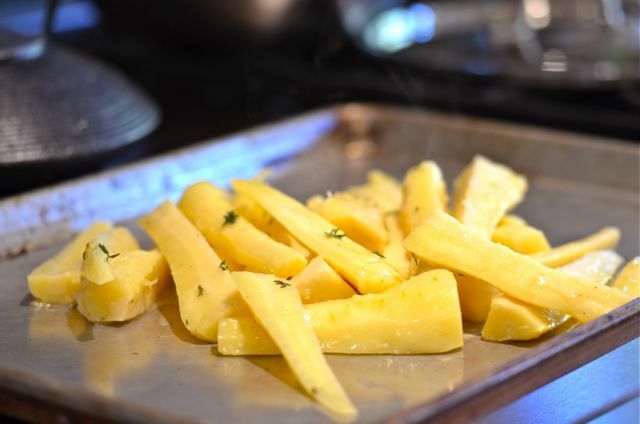 Peel and cut the parsnips into wedges, halve the thin ends and quarter the thicker ends. Steam for ten minutes and then toss the parsnips with a mixture of butter and bacon fat or beef drippings, salt, pepper and thyme (olive oil doesn’t seem to love parsnips, just a FYI). Lay out the wedges on a baking dish and cook in a 350 degree oven for one hour. About halfway through the cooking turn over the parsnips so they caramelize on a few sides. And they will caramelize and give you a sweet, slightly crispy outer crust that gives way to a sweet, earthy and creamy center, simply delicious. 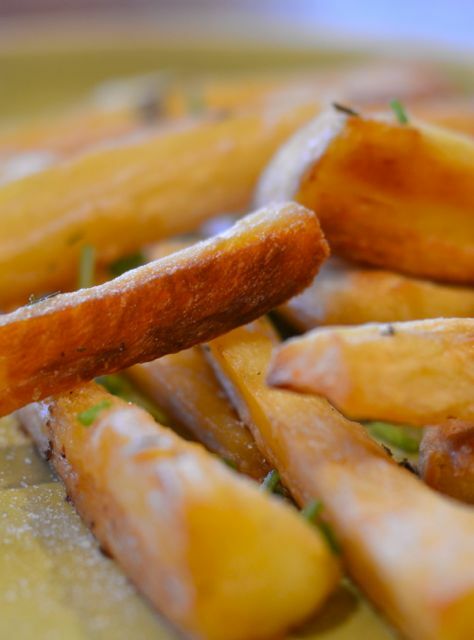 You can serve these with almost any meat dish, but we garnish the parsnips with a bit of coarse salt and some chives and start snacking…they never last more than a few minutes. There isn’t a lot of fat in the dish, but it does add flavor. 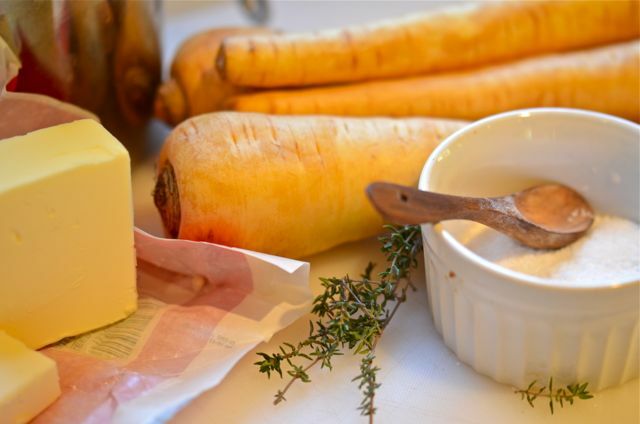 Animal fats like pork, duck or beef work very well with parsnips, but butter also works, if that is what you have. 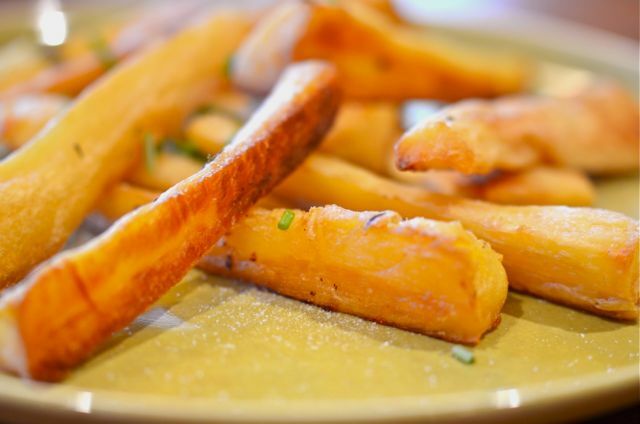 Olive oil and parsnip flavors are an uneasy marriage. If you must use oil, use a neutral oil like canola or corn oil and add a bit more seasoning. What You Get: A delicious and healthy winter vegetable dish. A very good way to introduce skeptics to parsnips. What You Need: A steamer / steaming basket is helpful here. How Long? About 65-75 minutes, with about 10 minutes of active time. Root vegetables need time to cook, plan accordingly. Place a rack in the middle of the oven and preheat the oven to 350 degrees. 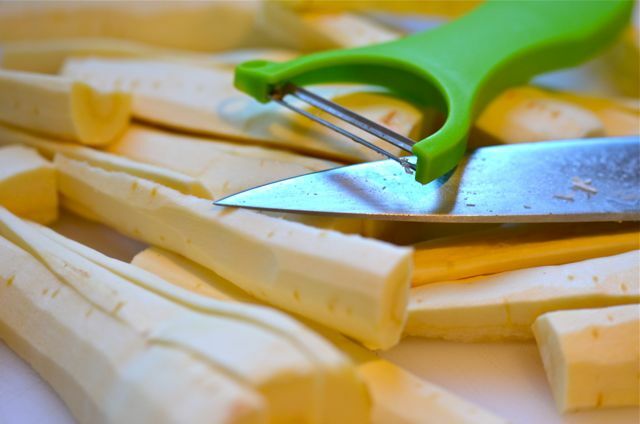 Peel the parsnips and cut them in half. Halve the thin ends and quarter the thick ends, lengthwise, into long wedges. Place a large saucepan over medium heat, add a half-inch of water and a steaming basket. 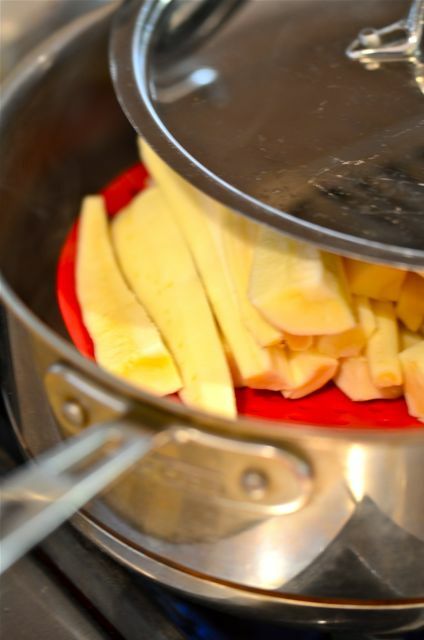 When the water reaches a low boil add the parsnip wedges and cover the pot. Steam for 10 minutes. Remove the parsnips from the steamer and place in a large bowl with the butter, fat, thyme and a few pinches of salt and pepper. Toss until the butter and fat melt and coat the parsnips. Then lay out the parsnips, flat side down onto a baking sheet. Place the baking sheet in the oven and cook for about 60 minutes, or until caramelized on the outside and soft in the center. Flip the parsnips about 30 minutes into the cooking time. 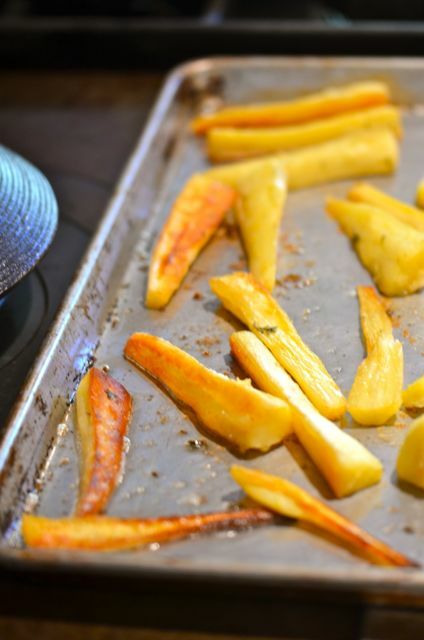 Remove the parsnips from the oven and taste for seasoning. Season and garnish with finely chopped chives. Serve. Lovely post, stumbled across your post while my own parsnips are roasting in the oven! Nice! Hope they turned out well! Pride has something to do with it but I think the short commute from ground to table helps keep the natural sugars there. Once pulled the sugars start to break down so by the time they get to the store I’m not a fan! I agree, parsnips are totally underrated, especially roasted parsnips. Great tip on steaming before roasting. sooooo good… love your pics! I adore parsnips. They are at their best roasted. You’re so right though to point of the importance of cooking them thoroughly! I sometimes do the steaming trick with potatoes too. So true! I’ve botched tons of stuff just because I wasn’t patient enough. Thanks for the steaming tip! Our first crop of parsnips is currently brightening up our Driveway Garden, and I’m eager to sneak a taste soon. Steaming! Why didn’t I think of that? I love parsnips, but they always, ALWAYS get that woody section that makes them kind of gross when I do make them. Steaming! Hope you try and enjoy the parsnips! Once again, you’ve taken a veggie I’m often stumped by and made it sound delicious in a wonderfully simple preparation. Now I know what I’m doing with the parsnips that just arrived in our CSA box! Roasted parsnips … one of my favorite winter vegetables – for all our Christmas dinners, working over in UK – I turned them in grated Parmesan before putting them in the oven – wonderful and the smell. I’m also often mix parsnips into my mash potatoes. I do just like you blanch them .. before they go in the oven. 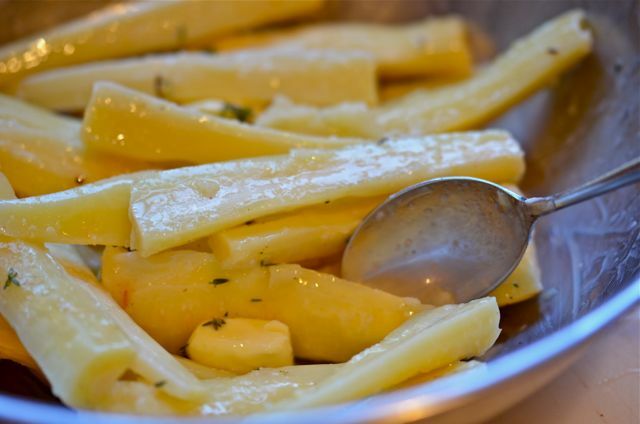 We will have to try w/parmesan…parsnips seem to do well w/cheese…thx! Yes, it does … I think you will like it. Was so tired on basic roasted parsnips with our big amount of turkey dinners .. and also we used fresh coriander and orange juice to boil our carrots, brilliant idea I had there. I made these tonight; so good! My neighbor came by and we almost had none left for dinner. Next time I’ll double the recipe for sure. Excellent post. Parsnips is something I learned to enjoy from one of my UK friends. I believe I microwaved mine first and then roasted — last time i made them (too long ago to recall). Def will add the thyme next time. Thank you! Pingback: Spiced Roasted Cauliflower « Stephy K.
I like parsnips but mostly do puree. Good idea to steam them first. I’ve never tried them with olive oil, always with butter and cream. Beef fat as in my cauliflower recipe would also work I guess. Thanks for sharing! Thanks! Parsnip are very, very tasty- worth a try! Steam before baking, genius! Probably would cut the cooking time on sweet potato fries too!